North of Palestine the high fertile plain of the Bekaa valley spreads out between the Lebanon and Anti-lebanon mountains. These parallel ranges of mountains form the sides of the rift valley geological structure, which runs all the way from southern Africa, as far as Turkey, two hundred miles to the north. From the Mediterranean, the land rises by degrees to the snow clad mountains seen in the background of this picture. The highest parts of the mountains reach 10,000 feet, and the slopes were once covered with the mighty Lebanon cedar trees. The name Baalbek translates as valley of the great lord, an expression of great significance in the interpretation of the past. The town stands on a key spring head site at the high point of the watershed at a level of 3,450 feet. The river Orontes flows north through Kadesh and Homs to the plain of Antioch, and the Litani flows southwards and then westwards to join the Mediterranen near Tyre. It was from Tyre, Sidon and in particular Byblos on the coast, reputed to be amongst the world's oldest cities and ports, that cedar timber was shipped to Egypt before 3,000 BC. This was the area praised by the prophets of the Old Testament for its beauty in their poetic imagery. This was the area of the sacred cedar forest and the sacred cedar groves. To the Romans this large valley and plain was known as their granary. The suitability for agriculture and the numerous mounds, remains and relics in the area, bear witness that the valley must have been heavily populated in the most ancient times. In the Sumerian texts we find that it was decreed that Baal Hadad should govern the highlands in which Ba'albek would later stand. Constantine is reputed to have still regarded Baal Hadad as the supreme being, when he adopted Christianity for the Roman Empire. Up to that time, c. AD 300, people had come for at least 2,000 years on pilgramage from Africa, Asia and Europe to pay their respects to the Gods at the temples on the Baalbek platform, of which the Temple of Bacchus shown here, is but a small chapel incomparison to the main structures erected on the platform. 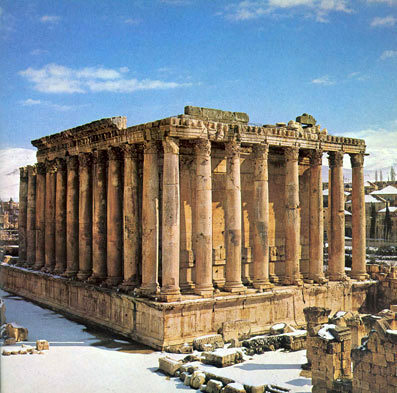 Alexander the Great conquered Baalbek c. 348 BC and re-named it Heliopolis (City of theSun). The Temple of Baal Hadad at both Baalbek and Damascus became known as the Temple of Jupiter Heliopolitanus. Jupiter being the Roman name for Hadad.